Switched from each round sponsor payments to daily! Why is it good for promoting? Check current settings on the Steem Upvote Bot Tracker and send bid using usual way with URL in the memo. You got a 28.81% upvote from @oceanwhale courtesy of @drorion! Earn 100% earning payout by delegating SP to @oceanwhale. Visit www.OceanWhaleBot.com for details! You got a 55.48% upvote from @brupvoter courtesy of @drorion! Hello. 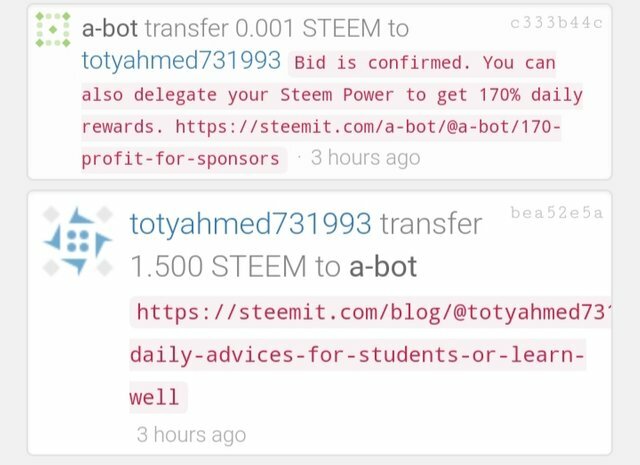 I transferred 0.4 steem to your bot from @vitranc account to upvote a post on @apvotefromme account. Your bot comfred a transaction but there was no upvote. https://steemd.com/b/27443742#7940572c22281f987e0f1170d0e912aef778a7bc Can you check what happened and refund. Thank you. Is it possible to delegate just 10 steem to try your service? The 100% daily rewards sounds great! Oh yes .... and how do we un-delegate Steem... If one wished to! Sure, 10 STEEM can work too. Hey @a-bot, I am a unique content writer. But you blacklist me. I request you, unblacklist me. You can check my blog. Thank you so much. There was another problem. Your post was too old for the bot, but it was fine when you sent the bid. We have limit post age in 2 days. What does it mean 100% reward? Does it mean 100% of author and curation profit? How much profit in daily if I delegate 10000 SP average these days? We are returning 100% of STEEMs and SBDs sent to bot for post promotion. We are not powering down, so curation profit stays on bot account. It increases the return for delegators, because its SP is using for promotion too. But, at the moment, a-bot owner @drorion is returning every day 20STEEM from his profit to the bot. Which is more than curation reward. I delegated more than 150k to a bot, If I delegate the 150K SP, Is there any problem? If the profit is better than the one I using, I will also delegate more than 300K SP total. If that is OK with you, send me a note please. We are returning 100% to delegators. To compare profit, you can delegate to us, for example 1.5K and in few days compare with your 150K delegation. Then, you can decide what is better. OK, I will delegate around 280K SP, navyactifit and julialee66(my wife) SP five days later. Delegated 10SP for testing you.